Photographs copyright © 2004 by Jeffrey L. Thomas. 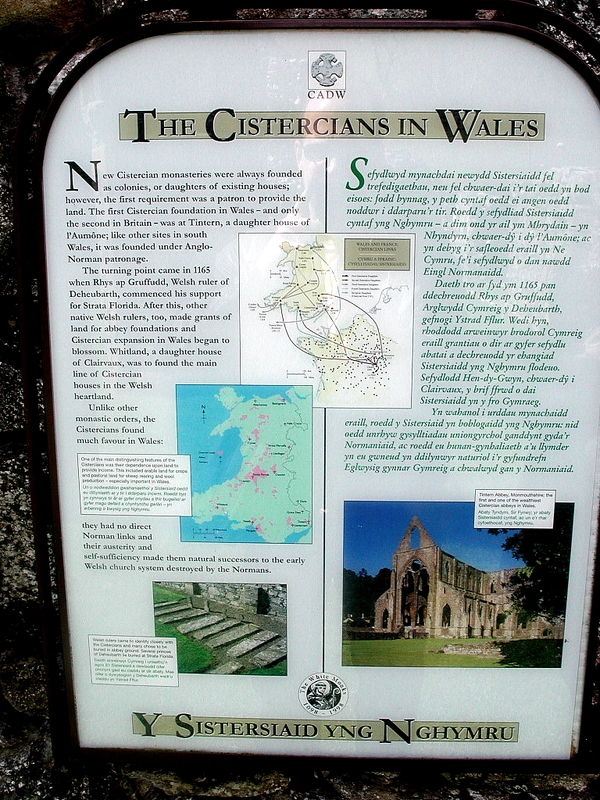 The Cistercian abbey of Cymer was founded in 1198-9 under the patronage of Maredudd ap Cynan, a grandson of Owain Gwynedd. 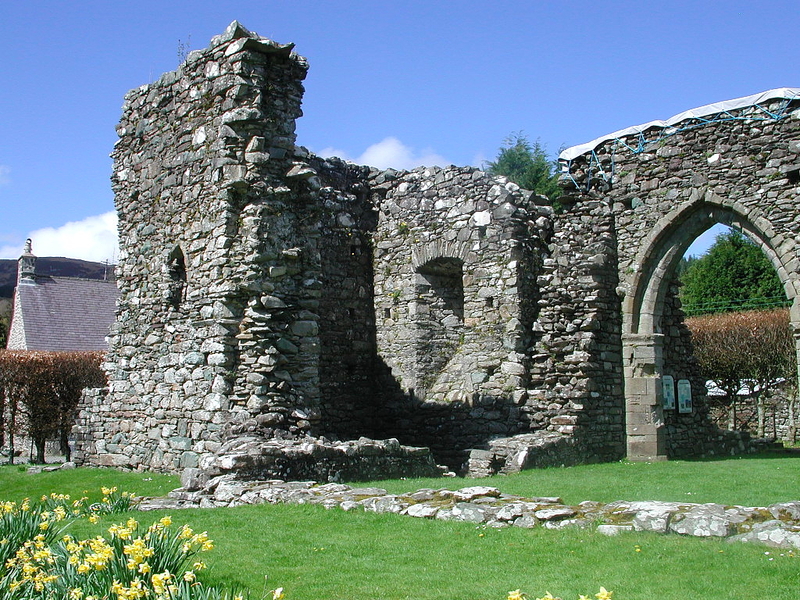 The first monks came from Abbey Cwmhir in Powys, which was a daughter house of Whitland in Dyfed, itself founded by monks from Clairvaux, the mother house in Burgundy. 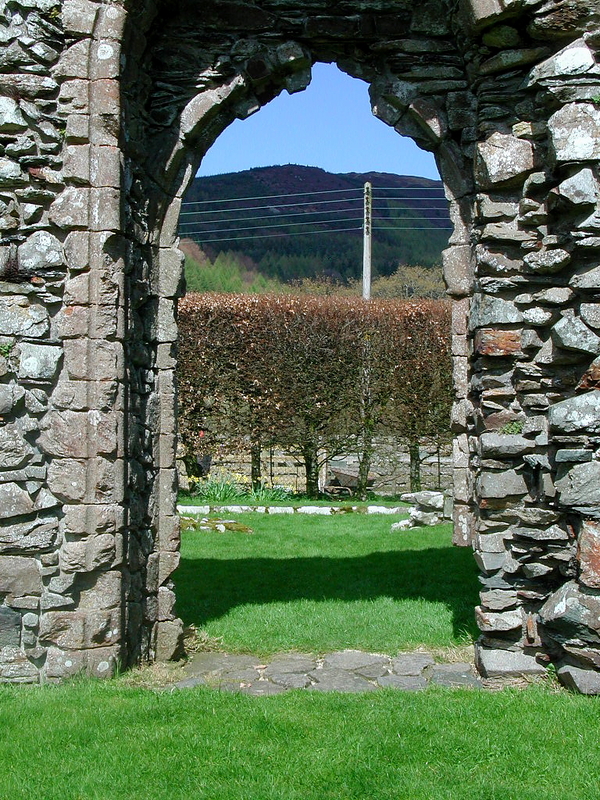 The monks farmed sheep on the local hills and on lands in Lleyn, and were involved in mining and metallurgy. They also kept a notable stud, rendering high-quality horses to Llywelyn ap Iorwerth. 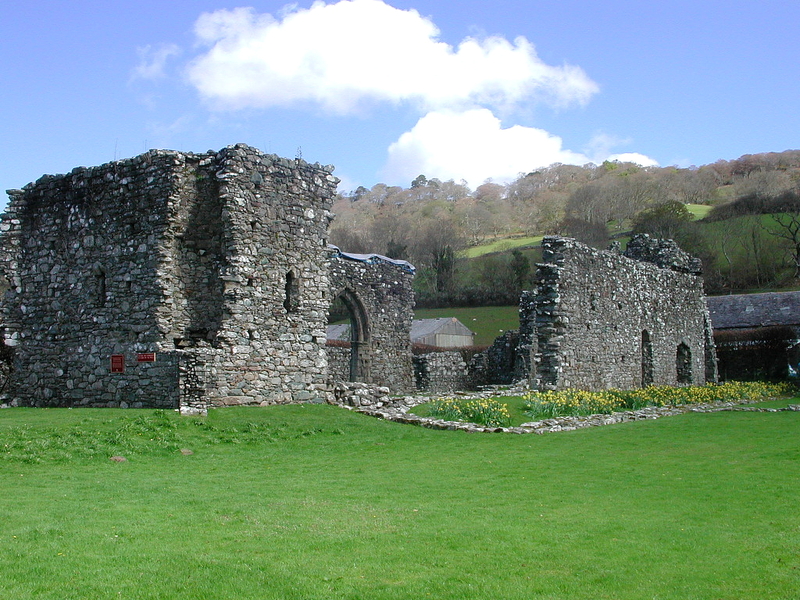 But the abbey was never especially wealthy, and after the wars of the 13th century its economic position declined further. However, it did possess a very large and fine silver gilt chalice and paten, which must have been hidden on the mountainside at the Dissolution. 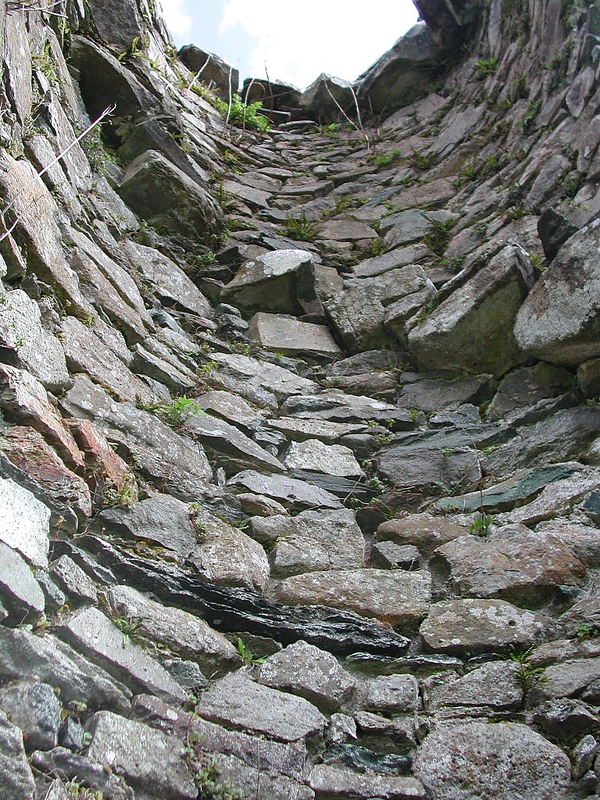 They were rediscovered in the 19th century and are now in the National Museum of Wales in Cardiff. 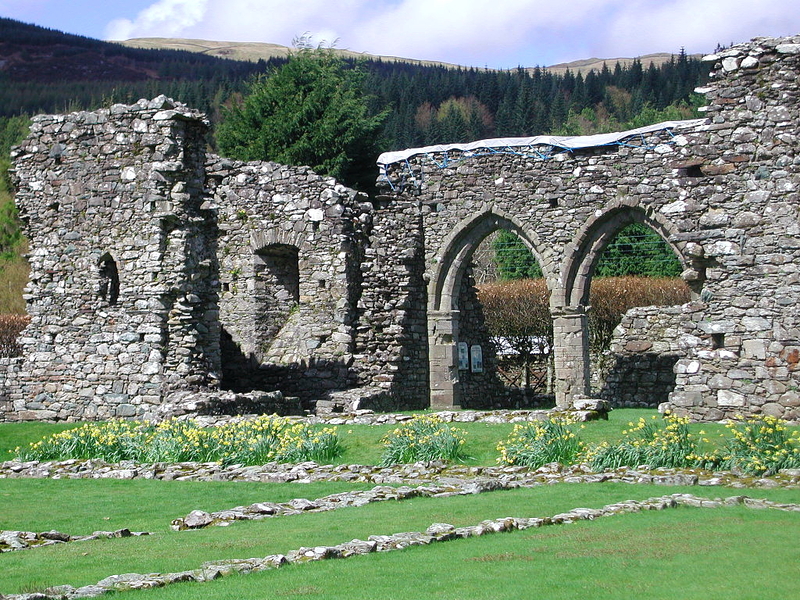 At the Dissolution in 1536 the abbey was worth only L51 (roughly L16,500 in today's terms). 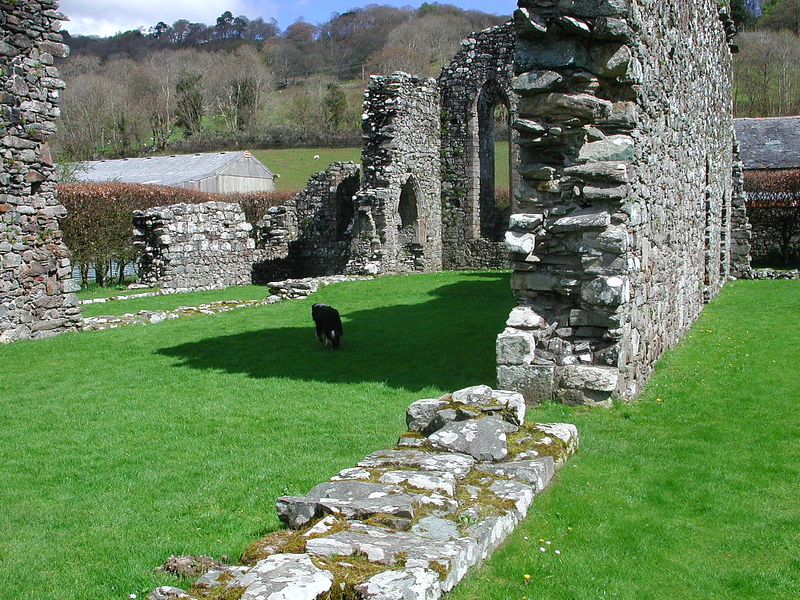 This poverty is reflected in the abbey buildings. Only the church survives to any height. 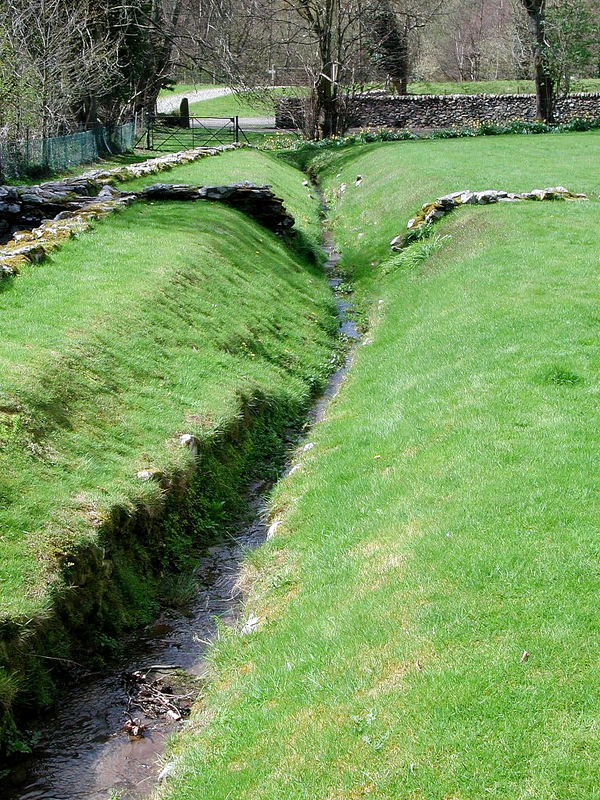 It consists of an aisled nave just over 30m long. 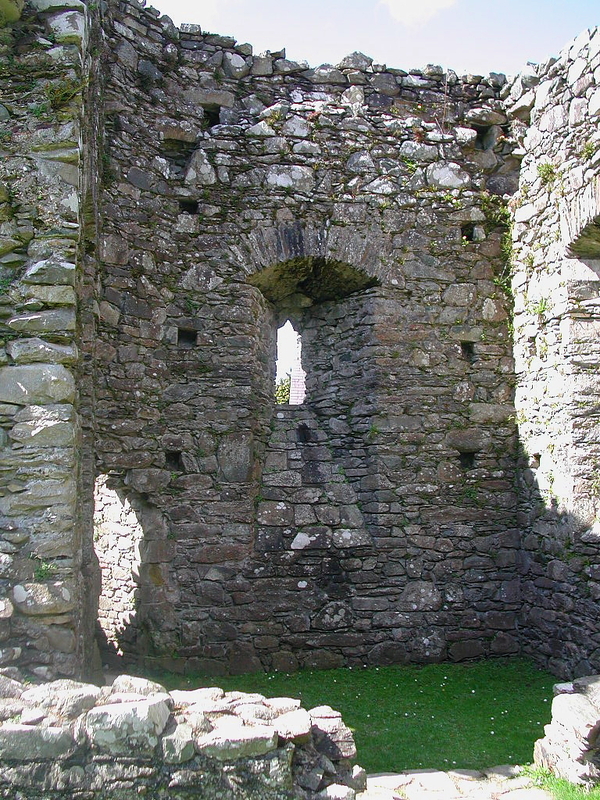 The monks probably intended to build the normal crossing with two transepts and a chancel to the east, but this was never done and the present east wall and chancel area seems to be a compromise arrangement. 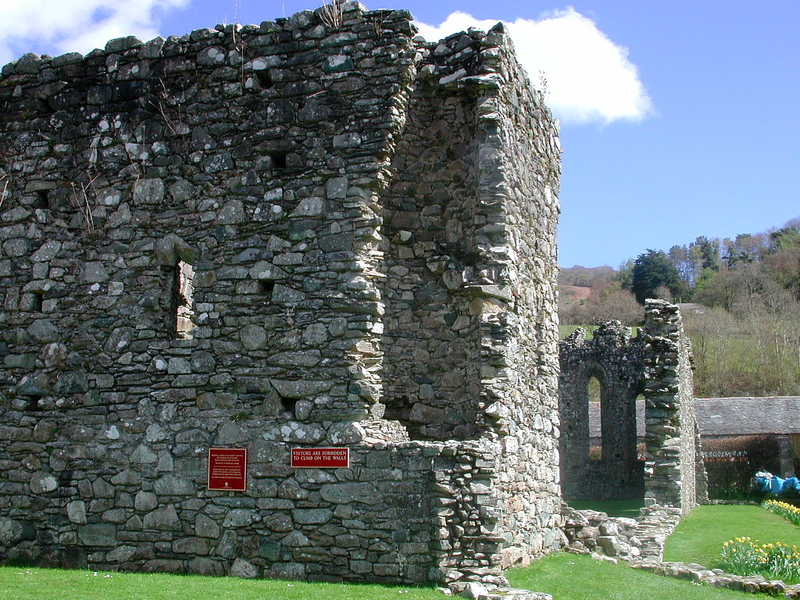 In a normal Cistercian church the tower would have been over the central crossing, but since no crossing was built, when the tower was added in the 14th century, it was put at the west end. 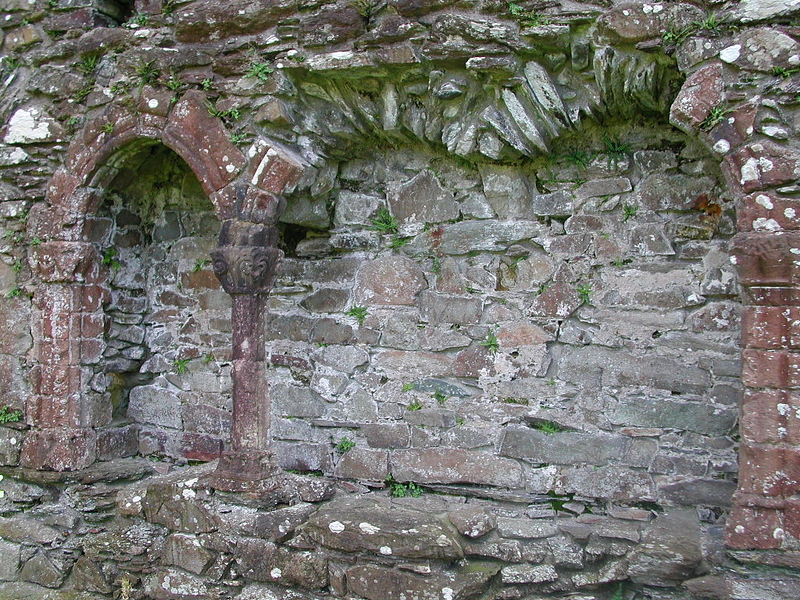 Cistercian churches were normally beautifully proportioned but not richly decorated. This one is especially plain, but there is some attractive carving on the sedile on the south wall of the chancel, and a little survives on the severe east window. 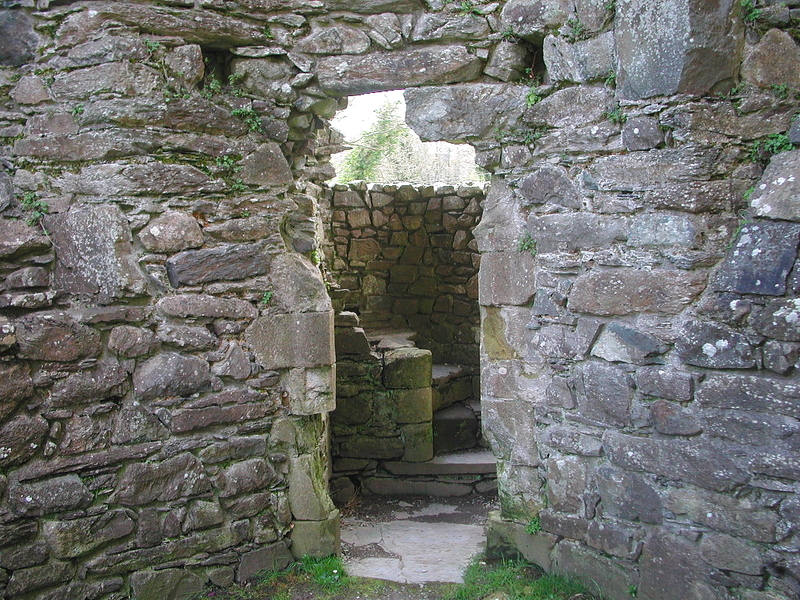 The small putlog holes to support scaffolding would have been covered by plaster. 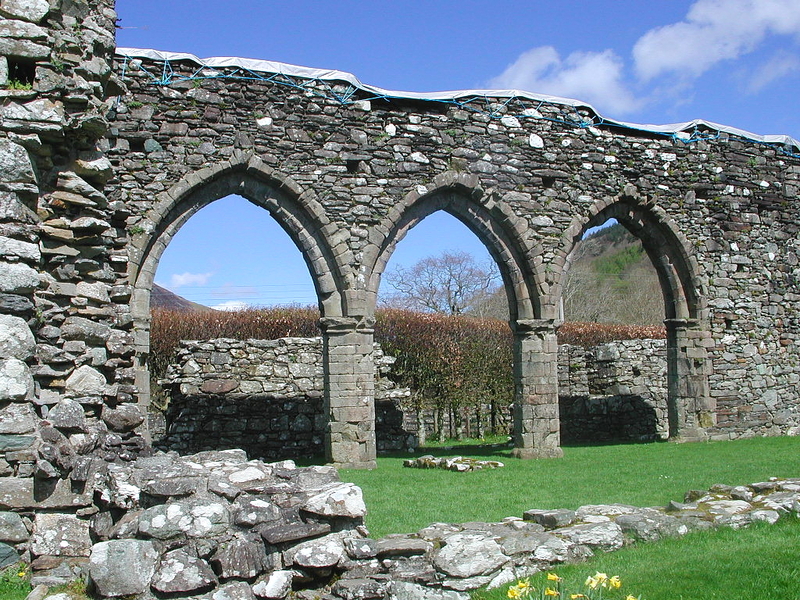 The monastic buildings to the south were never extensive, and it is possible that some of the domestic quarters around the cloisters might have been of timer. 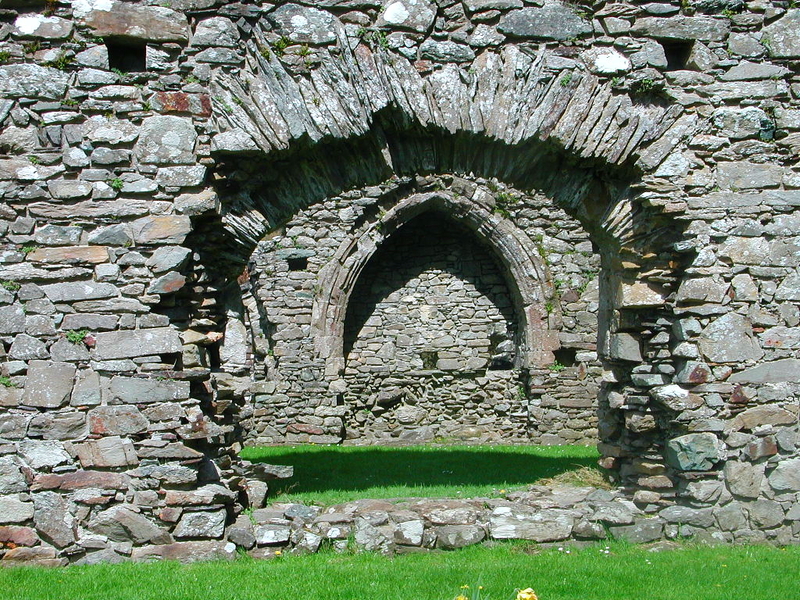 Monasteries were laid out to a standard pattern, traditional to each order. 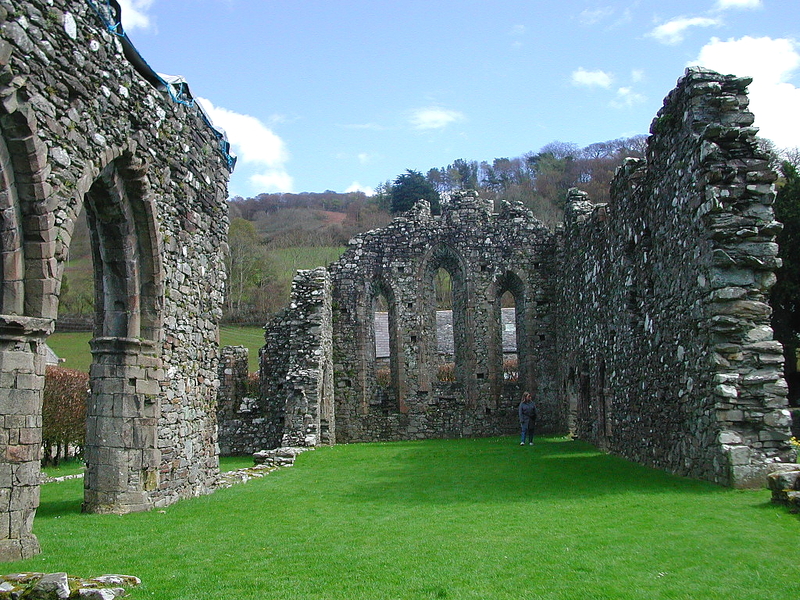 The cloister, the chapter house and dining hall are all in their normal positions around a square on the south side, and their planning anticipates the unfulfilled enlargement of the church. 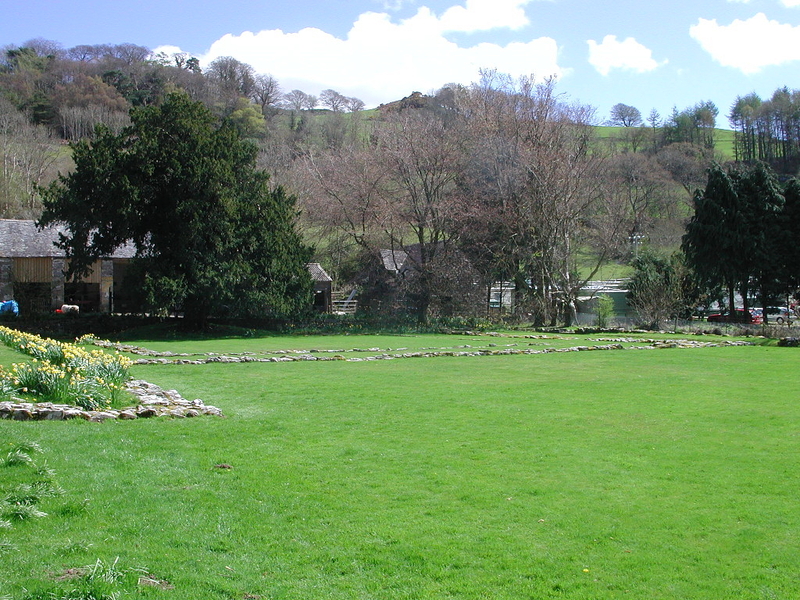 It is possible that the present farmhouse incorporates part of the monastic guesthouse, and there may have been sheds on the river associated with the abbey's agricultural or industrial business.